WASHINGTON, DC, November 10, 2010 (ENS) – The U.S. EPA has issued a subpoena to Halliburton, requiring information about the chemicals used by the energy and engineering company to fracture shale rocks, releasing the natural gas they contain. Halliburton was subpoenaed after failing to voluntarily meet EPA’s requests for information needed for a congressionally mandated hydraulic fracturing study to investigate the potential adverse impacts of the practice on drinking water and public health. 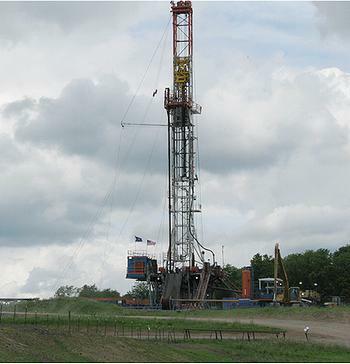 EPA’s Office of Research and Development will conduct the scientific study to examine the possible relationships between hydraulic fracturing, or fracking, and drinking water quality. Halliburton has been given until December 1 to submit the requested information. The agency is under a tight deadline to provide initial results by the end of 2012 and the thoroughness of its study depends on timely access to detailed information about the methods used for fracturing. EPA expects to begin the study in early 2011. On September 9, EPA asked nine national and regional hydraulic fracturing service providers – BJ Services, Complete Production Services, Halliburton, Key Energy Services, Patterson-UTI, RPC, Inc., Schlumberger, Superior Well Services, and Weatherford – for information. The agency is seeking information on the chemical composition of fluids used in the fracking process, data on the impacts of the chemicals on human health and the environment, standard operating procedures at their hydraulic fracturing sites and the locations of sites where fracturing has been conducted. Except for Halliburton, the companies have either fully complied with the September 9 request or made unconditional commitments to provide all the information on an expeditious schedule, the EPA said. Halliburton responded only that it would use its “best efforts” and “endeavor to complete its response” by the end of January 2011, according to a letter written by Peter Silva, the EPA’s assistant administrator for water to Halliburton Chairman and CEO David Lesar accompanying the subpoena. “EPA believes that Halliburton’s response is inadequate and inconsistent with the cooperation shown to date by the other eight companies,” Silva wrote. EPA announced back in March that it would conduct this study and solicit input from the public through a series of public meetings in major oil and gas production regions. The agency has completed the public meetings and thousands of Americans from across the country shared their views on the study and expressed support for this effort, the EPA said. The information provided by the companies will also be considered for “possible guidance assessment and rulemaking,” Silva said in his letter. A 2005 vote in Congress exempted the practice of fracking from regulation by the Clean Water Act after a 2004 federal government study determined that the practice poses little threat to human health. But fracking has polluted drinking water sources in Wyoming, Colorado, Texas, Arkansas, Pennsylvania and New York, according to state and federal regulators in a September survey of more than 100 cases compiled by the nonprofit Hudson Riverkeeper. The Riverkeeper report is based on the investigations, findings, and statements of state and federal regulators in areas where fracking is common – the Marcellus Shale region of Pennsylvania, Ohio, and West Virginia; the Barnett Shale of Texas; and the Fayetteville Shale of Louisiana and Arkansas; as well as regulators in the western states of Wyoming and Colorado. While the exact components of each fracking fluid mix are closely held industry secrets, previous studies and a congressional investigation have shown they may contain barium, strontium, benzene, toluene, ethanol, and nonylphenols, diesel fuel, acetone, boric acid, ethelyene glycol, isopropanol, hydrochloric acid and/or formic acid. The oil and gas drillers can keep secret the chemicals they inject underground because, unlike most other industries, they enjoy waivers under the Safe Drinking Water Act, Clean Water Act, Clean Air Act, Resource Conservation and Recovery Act, Superfund, the Emergency Planning and Community Right to Know Act and the National Environmental Policy Act.